Formula One: Rosberg gets Brazil pole as Hamilton edges closer! Home » Formula One: Rosberg gets Brazil pole as Hamilton edges closer! 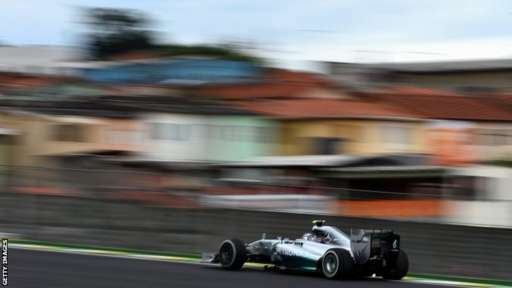 Nico Rosberg has qualified on pole position for the 2014 Brazilian Grand Prix after edging out team-mate and title rival Lewis Hamilton by 3 hundredths of a second. With just 2 races to go in the championship, including tomorrow, Rosberg and Hamilton were concentrating on themselves for the fight for pole, however they were caught by surprise as Williams came within a few tenths of the Mercedes duo. Felipe Massa took 3rd in front of his home crowd with Bottas 4th, but it could have been much better as the pair bailed out of their final runs. The much threatened rain that had been forecast for this weekend failed to materialise for qualifying. Once again, with the financial issues affecting Caterham and Marussia, there would be 4 cars eliminated in Q1 and another 4 in Q2 before the top 10 shoot-out. Nico Rosberg would continue his run of being fastest in every session so far this weekend after topping all 3 practice sessions. He was 2 tenths clear of Hamilton, a margin that had stayed the same throughout practice. Esteban Gutierrez and Adrian Sutil found out earlier this week that they would not be racing for Sauber next year after the appointment of Marcus Ericsson and Felipe Nasr. They were now fighting to get a drive next year with another team. They were both at risk of being eliminated in Q1, so they came out on the fastest tyre straight away. Sebastian Vettel was also under threat of elimination in the session while he suffered with a brief engine glitch. He wasn’t pulling away very well on the exit of corners and subsequently was only 13th, 2 positions away from elimination. Both Lotus drivers had seemed to be improving after their reasonable showing at Austin last week, however they were both eliminated in Q1 along with Sergio Perez who has a 7 place penalty due to his contact with Sutil last time out. Jean-Eric Vergne would also be eliminated and would later go onto to complain that his car was awful to drive. 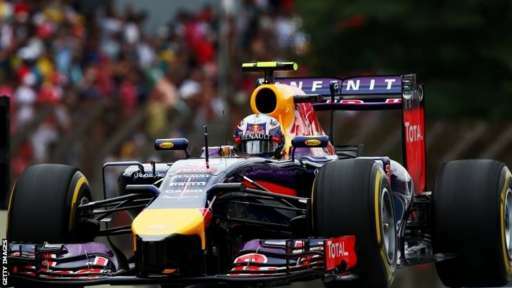 Daniil Kvyat decided not to make a single run in the second session of qualifying to save tyres for the race. The Russian also had a penalty for an engine component change. Three other drivers would join him in not making it into the top 10. Rosberg once again topped the session for Mercedes, but this time the Williams drivers were in 2nd and 3rd, with Hamilton 4 tenths off of Rosberg in P4. The Williams drivers had both managed to put in impressive lap times despite not looking as comfortable as the Mercedes drivers. Perhaps they would be able to get their 2nd pole position upset of the year like they had done in Austria. Sutil failed to make it into Q3 as he had done in Austin after running off track at Juncao. His team-mate would also be eliminated. Nico Hulkenberg had started on pole position for this race in 2010 but wasn’t able to get into the top 10 this time. Fernando Alonso was just on the cusp of elimination in P10 after being pushed down by Daniel Ricciardo who only made one run in the session and managed to go P8. The sudden improvement by Williams had really opened the door for a fantastic fight for the penultimate pole position of the year. To add to this, the pole position trophy could be claimed by Nico Rosberg if he took P1. Finally the outright qualifying record at Interlargos set by Rubens Barrichello in 2004 was under threat after the repaving of the entire circuit had added a lot of grip to the track. 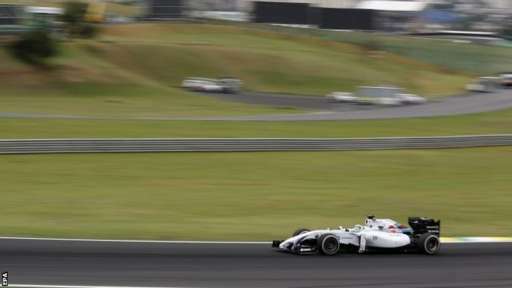 Lewis Hamilton was the first man to set a time before once again being beaten by Rosberg. However this time Nico did not hold the advantage he had done in previous sessions. He was on provisional pole by just a hundredths of a second. The two Williams drivers were next but were both having scruffy laps. Despite this, Bottas got within 2 tenths once again, with Felipe Massa managing to get a few hundredths down on Hamilton even though he had been 4 tenths off as he entered the final sector. As the drivers came out for their final runs, it really looked as though the Williams pair had a chance if they could hook their laps together. Hamilton was the first to make his final run and managed to take the top spot despite having a lock-up at Bico de Pato. The lock-up had forced Hamilton to go a little wide into the corner, which would ultimately be the difference between him and pole position. 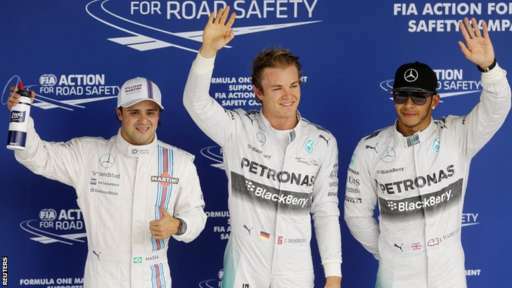 Rosberg capitalised on Hamilton’s mistake to take pole position by just 3 hundredths of a second. The Williams challenge ended soon after if had begun as both Massa and Bottas bailed out of their final laps. They would still lock-out the 2nd row on the grid, with Massa getting 3rd at his home race. Jenson Button and Sebastian Vettel would take the 3rd row with just 8 thousandths between the pair. Kevin Magnussen and Fernando Alonso were also within the same tenth as Button and Vettel. They will line up 7th and 8th, with Daniel Ricciardo and Kimi Raikkonen completing the top 10. *Both Perez and Kvyat had 7 place grid penalties.